On the look-out for the best mould spray? It's easy for mould to thrive in damp homes, whether it's caused by poor ventilation or more serious structural issues. However, it's important to deal with the problem quickly. Lots of mould sprays do a pretty decent job of not just getting rid of mould and mildew, but also of helping to ensure it doesn't return. We've curated a list of the very best mould sprays for your home; they're brilliant for tackling mould on everything from tile grout to walls. Use our guide to getting rid of mould and mildew for more practical advice on tackling the problem. Looking for more cleaning hacks? 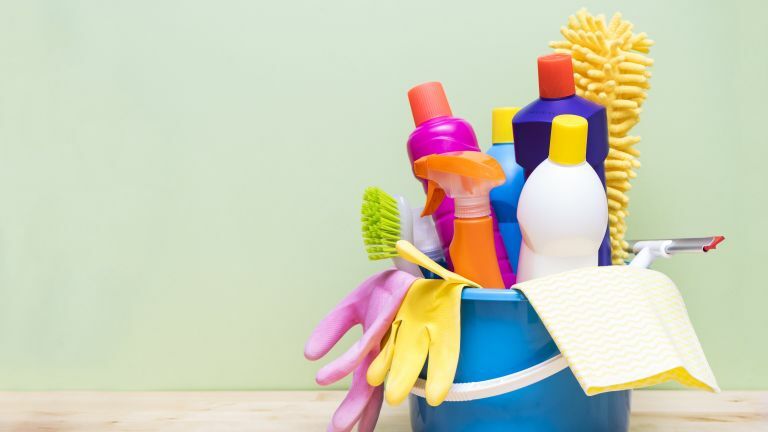 Visit our cleaning sourcebook for 50 cleaning product recommendations, or check out our cleaning hub page. Now, we know this is a list of the best mould sprays, but there's one product that comes of a brush for tidier application on those intricate areas. Perhaps you're eco-conscious and want a mould spray that is non-toxic, or you need something to specifically remove mould from your bathroom; whatever the problem, purchase a product to specifically target that area. If not, go for our first pick, Astonish Mould & Mildew Remover, which can remove mould from just about anywhere. As with the majority of cleaning products, once you've sprayed mould remover, you should open your windows to allow air to circulate the room as the smell can be overpowering. A highly effective, fast-acting mould spray, Astonish mould and mildew blaster is our pick of the best mould spray you can buy. For use on walls, UPVC window frames, glass, plastic shower curtains and much more, a little goes a long way to remove mould stains and most of all, kill 99.9 per cent of bacteria. Spray it on the affected area, leave for around 10 minutes and wipe clean. No scrubbing required – it's as simple as that. Because this mould and mildew blaster is so strong and effective, be careful when spraying as it does come out fast, and if you spray too much on your walls or leave it on for too long, it could remove paint or make it run. It's easy for bathrooms to develop mould, but it can be extremely difficult to get rid of, especially if the stains are deep into your sealant or grout. This mould spray is very effective at getting at tough mould stains (and it can be used to remove coffee or tea stains from worktops, too). Spray HG mould spray on to the affected area and leave for around 10 minutes. Rinse off with water and a sponge, and if there's still a stain, repeat the process. As with the majority of mould removers, this spray does smell quite strong. An ideal product if you have mould growing near wires or in an intricate place where a precise application is required, this mould remover has a brush head so you can apply product directly to target the affected area. It also works within minutes, and doesn't have a very strong smell, which is a bonus. Using the brush, spread the gel evenly over the stain and leave to work for 30 minutes. Wipe with a wet cloth and for very stubborn stains, repeat. You'll need to wash the brush head during application over a large area or you'll spread the mould, but overall it's a pretty effective product. Be warned: it comes out fast and it cannot be used on enamel, marble, aluminium, wood and granite. With a different spray head to give a lighter application, Cif Perfect Finish Mould Stain Removal Spray removes black mould stains from tiles within minutes. An ideal product to have in your bathroom cleaning basket. Spray it onto the mould from a distance and leave the product to work for 15 to 20 minutes. You can then either rinse with water or let the product dry on its own. While it doesn't do an amazing job on silicone (which, in our experience, is a difficult surface to remove mould from once it's established anyway), it can transform an otherwise rundown bathroom very quickly. This non-toxic bleach-free mould cleaner is ideal for those who are eco-conscious. It acts to remove mould fast and can be used on several surfaces. The best part is that because it's bleach free and non-toxic, it has little to no smell and is safe to use around pets. To use, simply spray on the (dry) affected area and wait until the product dries. Wipe clean with a damp cloth afterwards. Because the product has no bleach in, it won't work on stubborn mould or mould which is deep into silicone or grout (but then even the toughest products sometimes struggle with this). Other than that, in our opinion, this is the best mould spray for eco-friendly homes.